Egg Slicee, Dice And Wedge With This Easy 3 in 1 Compact Kitchen Tool Slice, dice and wedge with this easy 3 in 1 compact kitchen tool! Features *Measures: 8" x 3.25" x 5-3/4" / 20cm x 8cm x 14.6cm *Slice, dice and wedge with this easy 3 in 1 compact kitchen tool *Allows you to cleanly cut eggs, strawberries, fresh mozzarella, olives, avocados and button mushrooms *Features 3 separate cutting discs for slicing, wedging, dicing and a clear mini bowl for collecting the food *ABS frame and stainless steel wires *Hand washing recommended The Norpro Multi Egg Slicer allows you to neatly and easily slice, dice and wedge a variety of foods including eggs, olives, avocados, strawberries, fresh mozzarella, and even button mushrooms. Features three separate cutting discs and a clear mini bowl for collecting food once it's diced. 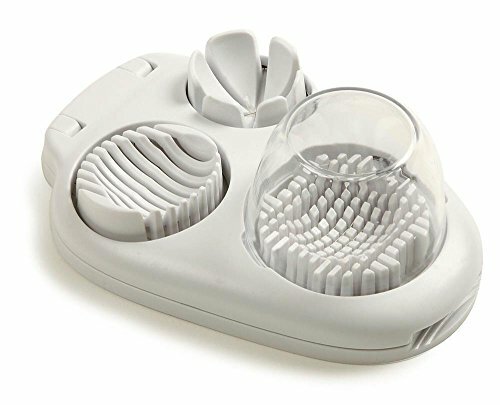 Deviled egg trays and Cobb Salads can both be made faster and easier using the 998 Multi Egg Slicer. This handy gadget creates slices, dices and wedges quickly. Does quick slicing work of strawberries, kiwis, bananas and mushrooms too. If you have any questions about this product by Cooking Utensils, contact us by completing and submitting the form below. If you are looking for a specif part number, please include it with your message.